KNOW YOUR TECH breaks down the scientific technology used in your favorite sneakers and activewear. 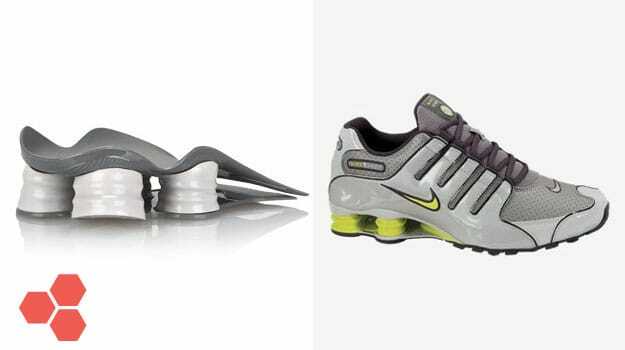 Let’s demystify your next purchase: today’s technology is Nike Shox cushioning. Introduced in 2000, this innovative setup was in development for a decade-plus. Although it&apos;s not used as prominently as it once was, it&apos;s still a suitable choice for those looking for responsive, protective cushioning. What is it? Hollowed out columns made of an energy-efficient foam which are paired with a Pebax dispersion plate for a stable and responsive feel. The foam utilized in the Shox columns is designed to be durable and produce a spring-like effect. How does it work? During footstrike, the Shox columns collapse toward the center as opposed to the edges of the heel, helping to absorb impact efficiently. This spring-like return results in forward propulsion and a slower rate of impact loading, which helps to reduce the risk of injury. Bottom line: Although Shox cushioning has recently been overshadowed by Nike technologies such as Zoom Air, Max Air, and Lunarlon, it remains an innovative and high-performing setup.